Do you watch "Color Splash" on HGTV? Well, I do--when Rand forces me to watch HGTV. I mean, it's not like I object or anything, but I'm more naturally inclined to watch reruns of "Seinfeld" or something. 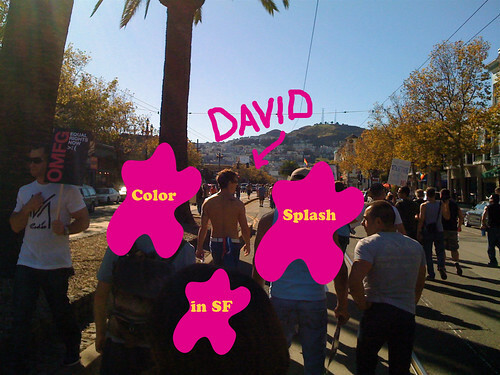 Getting back to my point, look who was protesting with us today in San Francisco: Mr. David Bromstad. Looking good, David! Okay, notice the guy on the left side of the photo walking away from David--totally clutching his pearls. Not that I didn't do the same thing, just mine didn't get captured on film.